Welcome to the Southern California Cadet Council Website! The 2019 Southern California Cadet Council Pinewood Derby will be held on Saturday, March 16th, and hosted by CrossPoint Church. The Events/Pinewood Derby page will soon be updated with information on times, registration information and some helpful tips on helping the boys with their cars. 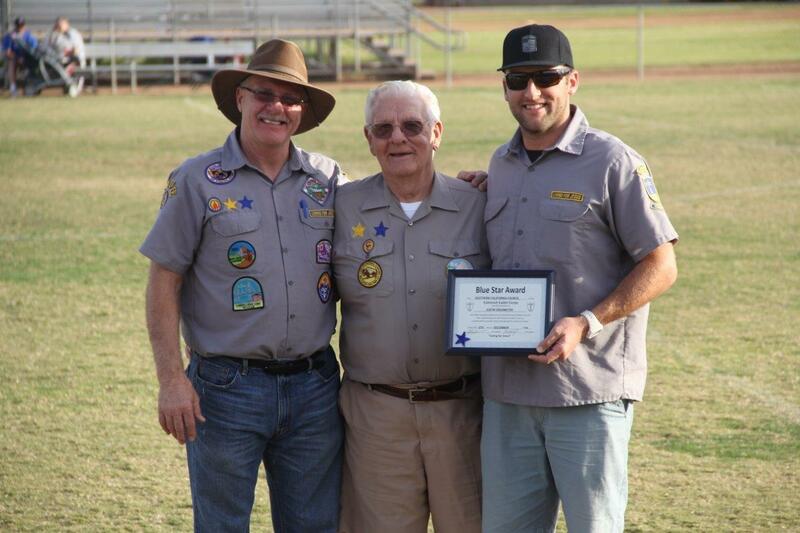 Making the 2015 Southern California Cadet Council Field Day was a presentation of the “Blue Star” to Emmanuel Reformed Church Head Counselor Justin Grasmeyer. S howing also the covenant faithfulness of our God, three generations of Blue Star awardees and head counselors from the same family attended the Field Day Awards presentation. From left to right are Jim Grasmeyer (Head Counselor at Long Beach Christian Reformed Church, and former Council Congressman), his father John Grasmeyer (who along with other faithful men and counselors set in motion our annual Field Day, now 35 years and still going strong), and Justin. Enter your email address to subscribe to the SoCal Cadets news feed, and receive new posts by email.